This review was written at the request of Open Road Media, who have just brought The Town and the City to ebook for the first time. Sob story alert: I had never read an ebook before and had no device for it, so used Adobe Digital Editions on my computer. Everything went well for the first 300 or so pages and then it stopped functioning. I suspect this is the fault of Adobe and/or my elderly laptop. The Open Road edition certainly looked nice and was very comfortable to read so those of you who have designated devices or are tech savvy don’t have to worry. Unfortunately, I could find no way of fixing the problem and so this review is incomplete as my reading is incomplete. Please keep that in mind. Jack Kerouac’s first novel (published in 1950) is a remarkably structured fiction, clocking in around 500 pages. It’s a lazy, nostalgic read, about the Martin family, about a time in America of Sunday drives and happily domestic housewives, when boys played baseball and tinkered with cars. As their lives go downhill Kerouac develops his own style, but the first hundred pages are definitely a slog – not because “all happy families are alike” and therefore boring; rather because Kerouac, apparently trying to emulate Thomas Wolfe, is writing something that feels like a sentimental, well-nigh Victorian family saga, all household angels and innocent babes, without any of the stylistic grace which that older generation had possessed. Peter Martin, the strongest stand-in for the author, is a sensitive lad who by sheer force of will makes himself over into a football player and discovers that to triumph was also to wreak havoc. Joe Martin, the oldest and wildest son, becomes a happy truck driver: On downgrades the truck would gain a giant momentum, he would jam in the clutch and let the whole mighty bulk roll in silence, and then at the foot of the upgrade he would again step on the gas and send himself roaring uphill in unbelievable glory. Nevertheless he broods and has secret longings for the sublime like any other man and is soon stealing trucks and hitchhiking across America. The two youngest boys don’t get as much play. For the older boys Kerouac divvied up his personal traits but he didn’t actually HAVE any brothers after the death of Gerard and such embellishments were not really his forte. As a family saga, there are also more female characters than are average to his books and his treatment of them leaves something to be desired. He addresses them with the same soulful tone, though the focus turns from outward striving to inward peace, in keeping with the idea that women are passive and men act. The mother figure is idealized (a problem Kerouac had in real life), love interests like Patricia have zero motivation for their behaviour and none of the women are as chaotically well-rounded as Mardou Fox from The Subterraneans – though that’s also true of the men. Kerouac simply had skills that did not fit the traditional novelist’s role and there’s a faint discomfort throughout The Town and the City as he makes stuff up and pads things out. If you’ve read any of his later works you can almost feel the tension in these pages. Kerouac was ALWAYS a pretentious writer, but with On the Road he cleared the decks. The structured, over-polished dignity went away, like he stood up and said “screw all that, I want to tell you about Neal Cassady. We’ll call him Dean Moriarty for now. Let’s talk about Dean Moriarty.” It’s refreshingly clear even when all is confusion. After the first months of his freshman year with its dark campus at night when soft golden light shone in library and lecture-room windows, after his wanderings in New York and Philadelphia, he was now returning to something wild and crude, to deep snow and raw gray skies, a flight of dark birds over the pines, to ice-locked brooks and kids skating and shouting in the frosty air, to old woodstoves in saloons and men in boots and jackets, to the New England of towns and woods and snowstorms and deep star-sparkling nights. He realized now with strong conviction that nothing which could be taught him in the university could ever touch the wild joy in his heart, the plain powerful knowledge of things, the boyish glee and wonder he felt now as the train bore him back to the weather and veritable landscape of his soul. The extolled simplicity of such a worldview contrasts dramatically with his puffed-up declarations on youth in America and is far more believable. Soon enough, the Martin father gets his mid-life crisis going. At fifty he was experiencing that second restlessness of manhood which is just as intense as the first restlessness of youth, just as wild, and open to springtime lurings, and subject to lonely futile whims, as that first urge to burst out of the shell of sameness and loneliness which men always know, but never conquer in peace and patience as women somehow do in time. I find this stuff so much easier to take when he’s tripping over himself to pour all his thoughts onto paper. What the hell did Kerouac know about the souls of middle-aged men or the inner lives of women? 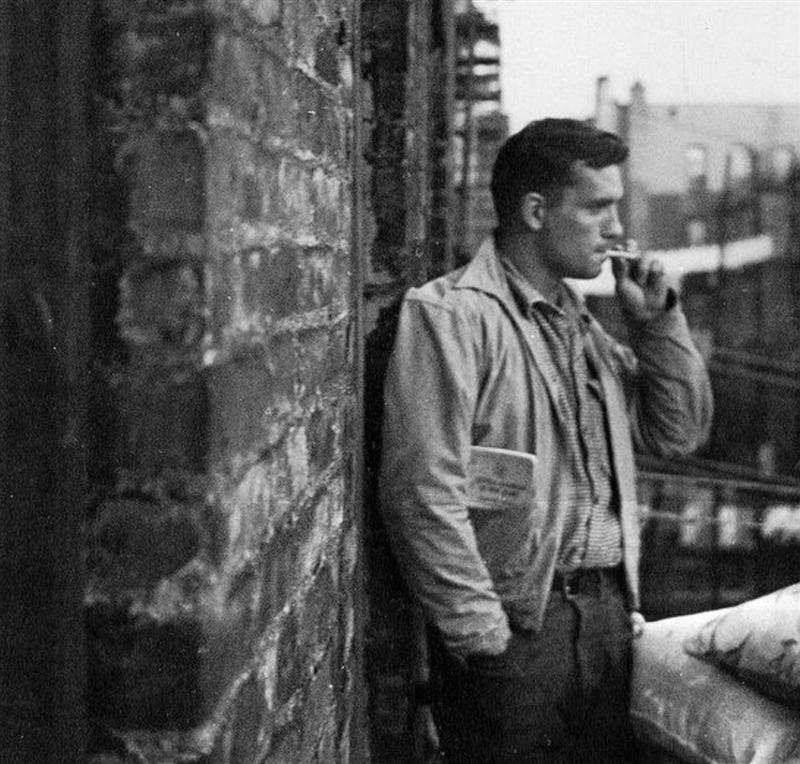 The Town and the City gives me new respect for Kerouac’s later work – he corrected so many problems. Gone are the awkward dialogue tags, much of the verbatim dialogue, and the attempts to be self-consciously “literary.” I never realised before just how good he must have become at self-editing. The Town and the City had 400 pages excised by the editor and it still contains lines like He tiptoed out of the room finally, leaving the woman to her fate, and hurried to a cafeteria where, over a glass of tomato juice that he could not drink, he literally stared into the abyss. The family’s situation degrades just in time for the U.S. to enter the war and things miraculously improve. The war adds some locomotion to the narrative, the Martins scatter to the four winds and a lightbulb seems to go off in Kerouac’s head and he starts developing a style of his own. This home stretch of possible excellence I did not get to partake of. Not being very tech-savvy, I could not fix my Adobe problem and since this gets to the heart of why I distrust ebooks in the first place I was unwilling to jump through technological hoops for a wonder of the Renaissance world. Other reviews back me up regarding the final “city” section being more like classic Kerouac and so I conclude for now. IF you’re an ebook pro with a device, check this out. It’s great that it’s available for people with maxed-out shelf space or a preference for Kindles and it is a nice-looking virtual edition. As for The Town and the City itself, while it gave me new admiration for his later books, I found very little of the Kerouac I enjoy in the pages. My Kerouac is the chronicler of a vanished bohemia and the literary gravedigger of his own life, predicting his downward spiral step for step and it is these traits that so fascinate me that are missing here. If Jack Kerouac is one of your literary lions, if your interest in him is either scholarly or fanboyish, then The Town and the City will be time well spent. The casual and curious among you should most likely stick with On the Road and The Subterraneans. 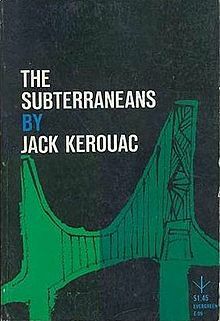 According to sources, Jack Kerouac wrote The Subterraneans in three days and three nights (benzedrine was possibly involved). Putting aside the obvious need for editing, this move on Kerouac’s part proves beyond doubt that despite what his detractors say he was a genuinely gifted writer – whether you consider the result an unholy mess or the opposite, it is quite readable for a 72 hour writing blitzkrieg. The prose habitually fractures – soaring rhapsodically for a longer or shorter time, coming apart in midair and finding new footing for a relaunch to do it all again. I can only describe this as “live” prose, a staged performance far outdoing On the Road as Kerouac unloads everything in a bid to prove that spontaneous prose is a real, viable and artistically pure form. Here’s Alene Lee sharing a human moment with W.S. 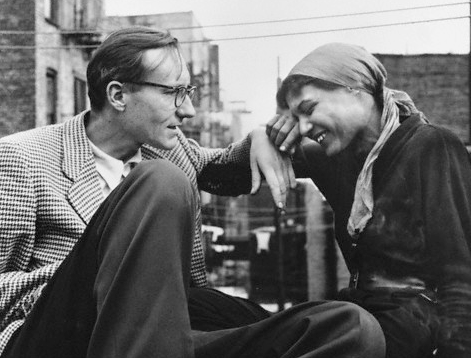 Burroughs. Photo by Allen Ginsburg. Kerouac was, even as Beats go, an extremely pretentious writer. His San Francisco is “gray” and “tragic” and his writer friends are inevitably compared to great poets and the angels: Julien Alexander the Christlike unshaved thin youthful quiet strange almost as you or as Adam might say apocalyptic angel or saint of the subterraneans… It’s flashy and ridiculous yet strangely endearing, even attractive. Such words were a part of the lingo (“beat” was linked to beatification, after all) so all the while Kerouac over-uses “Christlike” as an adjective to the point of silliness it doesn’t really dent the romanticism of the Beat Generation. The Subterraneans makes for a different impression than On the Road, written in a different style (think of it as portrait opposed to panorama). His scattered snapshots of the San Francisco underground are dizzy and inconclusive, leaving the reader hungry for more. It is the subtext of On the Road that comes to the foreground here: as all the friends Kerouac had at the start of On the Road didn’t want to hang with him at the end of it – four road trips in four years later Kerouac was still acting like an irresponsible man-child while others were starting families and holding down jobs. It was pretty clear to me as I read how Kerouac’s story would end and The Subterraneans functions as a commendably honest sequel, as he sets down an account of his growing problems as a self-described drunken maniac. Perhaps this is a poor place to get introduced to Kerouac but it is a necessary chapter for those interested in the man’s life story. But enough about him for now. The Subterraneans is just as much about Mardou Fox, a gentle, confused soul with at least one major breakdown in her past. She wants to settle down with Leo Percepiad and work on their relationship. He doesn’t. And in those days her love meaning no more to me than that I had a nice convenient dog chasing after me… Sad for him but good for her when she finally gives up and decides to be independent, no longer the little woman waiting at home all hours of the night fulfilling his real secretive Mexican vision of her following me down dark dobe streets of slums of Mexico City not walking with me but following, like Indian woman… Leo makes little to no effort at supportive behaviour and struggles with his basic prejudices and expectations of a woman’s role unsuccessfully. There’s no future for Mardou with him and when she finally blows him off it gives her a chance at a happy ending. Leo is left alone with his book of self-recrimination – deep in the dark pit of night under the stars of the world you are lost, poor, no one cares, and now you threw away a little woman’s love because you wanted another drink with a rowdy fiend from the other side of your insanity. …realizing it’s all myself, a big subjective phantasy that my mother really needs me and would die if I weren’t around… … …saying to myself “If you keep on drinking like that you’ll die…” Sadly, he did not listen to his own warnings, becoming demoralized, giving up on life and drinking himself to death in 1969. He was 47.